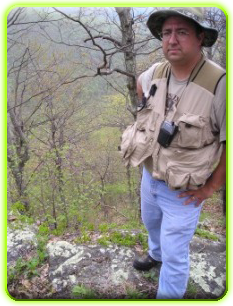 The above is an edited and cropped screen shot from the official Chautauqua Lake Bigfoot Expo page. Recently the The Post-Journal, a paper based in Jamestown, New York, announced the inaugural Chautauqua Lake Bigfoot Expo set for May 4-6 in Mayville. We provide an excerpt below and a list of the speaker line up. MAYVILLE - The inaugural Chautauqua Lake Bigfoot Expo will take place May 4-6 at the Chautauqua Suites. Hovey will discuss at the Expo the emotional turmoil a witness to a Bigfoot sighting can go through, and the toll such an experience can and does have on the personal and professional lives of people who are simply talking about being witness to something they can't explain. This turmoil and fear of has touched upon a number of eyewitnesses that have come forward to Peter Wiemer, Chautauqua Lake Bigfoot Expo chairman, in telling and emailing him about their personal eyewitness sightings here in Western New York. ...Events open to the public include a town hall-type meeting on May 4; a Chautauqua Lake Bigfoot Golf Championship at WoodCrest Golf Course at 9 a.m. May 5; and a Bigfoot Expedition in the early evening on May 5. The event culminates with the Expo on May 6, which will also include a Bigfoot Poster Contest for children and adults. 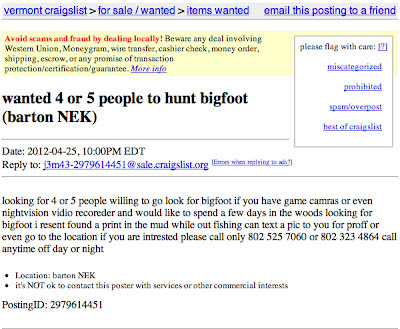 For more information, visit ChautauquaLakeBigfoot.com. 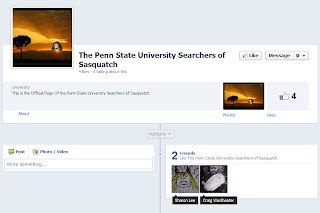 The line-up of the four speakers from the article is below (these are the same bios that are pulled directly from the speaker line up at ChautauquaLakeBigfoot.com. Wildlife expert and educator Larry Batson and his wife, Cheryl, have appeared on television shows and traveled around the country with their wildlife show. They have rescued animals ranging from baboons to snakes to large felines and travel to many schools and public events educating children and adults on the natural history of wild animals. Batson will speak both May 5 and 6, and will have some of his animals with him. Melissa Hovey is a paralegal and Bigfoot researcher from Ohio. She is the president of the American Bigfoot Society. Melissa is also a member of Sasquatch Watch of Virginia, and a former member of the TBRC. 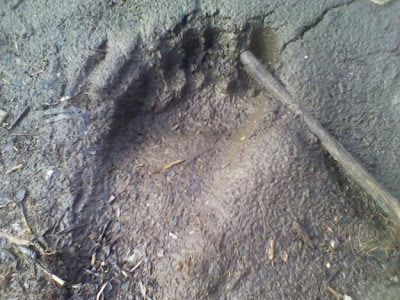 Since beginning her research in 2005, Ms. Hovey has started her own blog and forum entitled "The Search for Bigfoot." In 2007, she began co-hosting Internet radio shows starting with "Let's Talk Bigfoot," then she joined, "The Sasquatch Experience," with Sean Forker in February 2008. In June 2008, she began co-hosting a new program on Blogtalk radio, with Monica Rawlins, her friend and former TBRC board member and field researcher, called, "The Grey Area." Ms. Hovey was also featured on the all-female expedition episode of the History Channel's "MonsterQuest" titled, "Bigfoot" during the show's first season. Billy Willard is president of an environmental consulting firm. He oversees various types of environmental assessment and cleanup projects such as leaking underground petroleum tanks, environmental site assessments and soil and groundwater remediation. He is an OSHA hazwoper supervisor and holds many other credentials. He became interested in the Bigfoot phenomena early in life as a child after watching such movies as the "Legend of Boggy Creek" and the "Creature From Black Lake." In 2005, Wilard and his son Josh formed Sasquatch Watch of Virginia. Billy is vice president of the American Bigfoot Society, a director for The Alliance of Independent Bigfoot Researchers, member of the Northeast Sasquatch Researchers Association and a member of the Pennsylvania Bigfoot Society. In addition, Willard used to host an Internet radio program every Monday night at 9 p.m. on the Blogtalk Radio Network called "Sasquatch Watch Radio." Each week he has guests from around the world that include Bigfoot researchers and eyewitnesses. The shows are archived and available for listening. Steve Kulls began his quest in 1998 seeking knowledge from other researchers in the field. Kulls said he believes in a "boots on the ground" methodology of obtaining evidence for or against, evidence regarding the Sasquatch mystery. Kulls said he has had five sightings in the last 12 years and a handful of what he describes as "most likely, close encounters" with the creatures, after initially entering the field quite skeptical. Kulls has appeared internationally on television, radio and in print as well as appearing on the History Channel's "MonsterQuest" series (Bigfoot in New York) and on the NatGeo Channel's "The Truth Behind" series (The Truth Behind: The Loch Ness Monster). sightings in the country came from Missouri and Arkansas. It should be mentioned that further in the article Coleman has high praise for the individual BFRO investigators themselves, he makes a definite distinction between the commercial group ventures and the respected individual researchers. Mostly he talks about the history of hairy wild men and the sightings that took place in the Midwest--okay technically Oklahoma is considered part of the Intermountain Region, and the Midwest contains 10 other states, but that makes for a long headline. — Woolly corners of Kansas, Missouri, Arkansas and Oklahoma may support more than just black bears, mountain lions and wild hogs, according to one group of researchers. They believe the region also could hide a population of the legendary sasquatch. Skepticism is warranted, too, because the Four States is not only noted for its woolly corners, but also for its practical jokers. Such may have been the case in Chetopa, Kan., in February 1978. According to BFRO and media reports at the time, the Chetopa Police Chief was alerted to more than two miles of tracks, with footprints that measured 17 inches in length and nearly 6 inches in width. Thousands of people came out to see them. “After a while the chief supposedly found what was making the tracks, which was a 6-foot-6 kid named Chuck Bentley,” says the BRFO. Bentley later admitted he made large wooden feet and stapled them to his boots, and created large strides by running while friends served as lookouts. “I was just trying to add some excitement to Chetopa,” he said after he confessed. However, the BFRO website implies the chief may have concocted not the story of the tracks, but the story that it was a hoax, to get people to settle down and to keep the curious from stirring up the town. Bentley never returned telephone calls. Clever tricksters aside, Coleman says there is still much in the world that remains undiscovered. The growing field of cryptozoology, derived from the Greek word “krypto” meaning hidden, is the study of creatures that are not known to science, but are hypothesized to exist. to events, to research. Ray Crowe has organized them all. Ray is the type of man that would invite anyone and everyone to share his passion about Bigfoot. At the second annual Oregon Sasquatch Symposium his name was mentioned several times as the man who introduced prominent researchers to Bigfooting. Before social media like Facebook Groups and Blogs, and before you could Google "Bigfoot", Rays Crowe's Newsletter, "The Track Record" was the social media Bigfooters used to gather and learn from. I have only had the most recent fortune of meeting Ray Crowe. Thom Powell was kind enough to introduce me to Ray via email. We became instant pen pals and since last October I had gotten used seeing him at least once a month at his Western Bigfoot Society meetings located at Patti's Homeplate Cafe. I marvel when I think how much successful effort Ray put into getting people together, investigating witnesses, and providing compelling research to anybody curious enough to learn about Bigfoot. A lot of what Ray did is still being done today, but not by any one single person. Despite technology allowing us to do many of these things easier, it takes a special personality to do all of these things well. It takes a Ray Crowe. Charles Raymond Crowe (b. 1937) is a bigfoot researcher/archivist from Hillsboro, Oregon. Ray's initial interest in the bigfoot mystery occurred after he went with a group of bigfoot hunters from nearby Vancouver, Washington (a rather militant group, according to Ray), who dropped Ray off on an isolated road near the forest. Ray found a set of tracks he could not explain, and he decided then and there to start a group dedicated to sasquatch research. He called it the Western Bigfoot Society and held monthly meetings in the basement of his bookshop. Crowe also organized and held conferences in Carson, Washington called "Bigfoot Daze" in which he invited established researchers to speak. He also established a newsletter called The Track Record which told of the latest happenings in the bigfoot world, no matter how controversial or untrue. Crowe has a very open-door policy when it came to his meetings and newsletter, but he always warns his readers to "wear your skepticals." 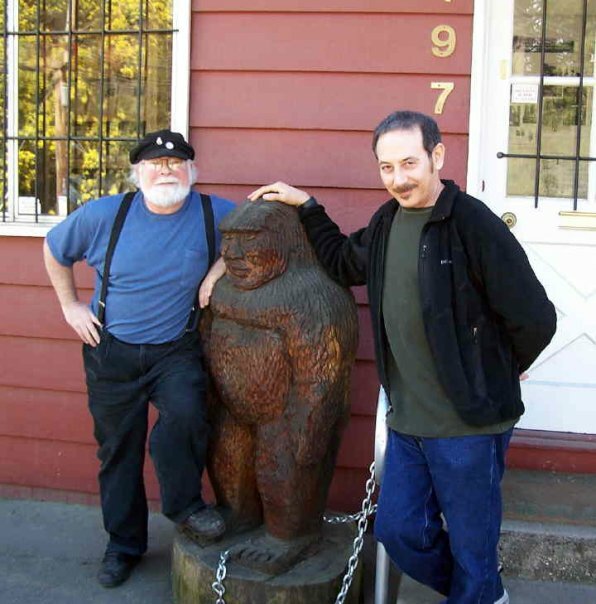 Crowe was about to shut down the newsletter and organization in 2006 (by that time the organization had been renamed the International Bigfoot Society), but controversial researcher Tom Biscardi offered to continue the newsletter and the organization with funding, which he did. [The crossed out section is incorrect and should read, "Ray sold the IBS/WBS to David Paulides."] Ray continues to receive reports and media articles from around the world. After closing his bookstore, he continued to hold meetings in various places until he started holding them at Dad's Restaurant in Portland. There should also be an update. As of October 2011, with the encouragement of Rhettman A. Mullis, Jr., Ray Crowe has restarted his Western Bigfoot Society monthly meetings. 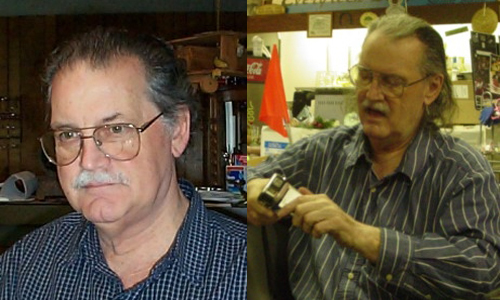 Mr. Mullis is President of Bigfootology and Ray Crowe is a senior member and advisor on the Bigfootology team. Here is how others have characterized Ray Crowe. April 25, 2012 update on Ray Crowe. The news continues to get worse. We have now entered death watch mode. The V.A. Hospital has determined that they are not going to treat Ray further and they are transferring him to a respite/hospice facility. They are expecting Ray to pass on at any time. At this point Ray is in God’s hands. There is still a chance that he may recover, but none of his doctors expects him to recover. April 26th update on Ray Crowe. Ray was actually up and about today. After eating all of this lunch he strolled down the hallway in his wheelchair and then was wiped out so he went back to bed and is sleeping now. He is in a lot of pain and his pain medication is not lasting as long as it is required before the next round of medication can be given. Other than that, Kate reports that he is in good spirit. I did not talk with Ray today because I did not want to disturb his sleep. I appreciate, as does Kate and Ray, all of the well-wishers, thoughts, and prayers. Please continue to do so. April 28th update on Ray Crowe. Ray is still doing okay. The vein in his neck is still collapsed and they cannot operate on it. The doctors have reiterated that it is not a good prognosis for him even though he is doing okay at the moment. He has some visitors today, Patti Reinhold, VP of the WBS, and her husband. Please keep your prayers coming and thank you for your continued encouragement and support from myself, Kate, and Ray. Below is a n interview Stephen Colbert had with Ray Crowe. The Buzzfeed has written an article that has already been reprinted across the internet at FindLaw.com and International Business Times. Don't you wish he had put a quarter or a dollar bill next to the foot so we had some sense of scale? Read the short viral article below and the original Craigslist ad. Mr. Withers, a 28 year old part-time farmer, is now looking to gather a group of Bigfoot hunters along with night vision goggles and motion activated cameras to go on an expedition to capture Bigfoot on film. I spoke with Roland, and so far three people have replied to his ad ready to join in the hunt. He's heard rumors over the years of Bigfoot sightings in his area of northern Vermont. He doesn't plan on bringing a gun for safety, which I strongly urged him to. "We don't want to hurt him." If Bigfoot gets agressive, Roland says, "It would be cool to get beat up by Bigfoot. UPDATE!! MK Davis has provided some more detail based on our question's about the black pixelation below. His new comments are in Green. 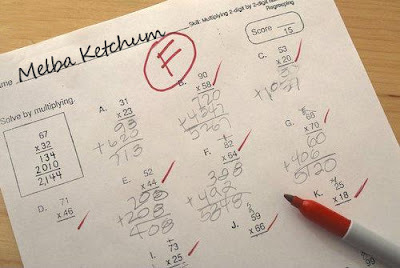 We applaud MK Davis for reacting to previous questions and critiques. He has searched through his archives to find the footage that is minutes prior the previous released footage. In this additional footage he seems to have more audio artifacts that he suspect could possibly be a tree knock. We still have issues with what we called the "leading dark pixel." We believe the leading black pixel is even more persistent in this previous footage. Hello Guy. Apparently the black halo that appears to wrap around or lay against the all white subject is an artifact of digitization. I rendered the VHS tapes myself, so it must have occurred when I did that. It mostly occurs when the file is rendered to High Definition video. This is what I did. 1080 pixels. Once again my fault. I did not know that could happen. This is why, in the bent knees clip that something black appears along the back side as it walks. I believe that this is the explanation. M.K. MK is pretty humble and would like to get feedback from the rest of you. He is curious what you see in the videos below. 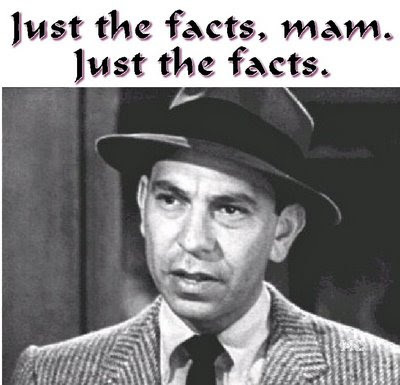 Joe Friday from Dragnet insisted on the "Just the Facts"
Our favorite skeptic continues to keep us Bigfooters on our toes. In an article posted on www.csicop.org Sharon Hill, who runs the Doubtful News website, questions the use of the word fact in our community. Sure, her article mostly focuses around Matt Moneymaker, who is an easy target for bold claims of Bigfoot behavior. The only argument we have is not all claims of Bigfoot behavior (including the examples she uses) are presented as facts. True, they don't have the disclaimer of being speculation, but that's because everything about Bigfoot is, by default, speculation. Isn't it? Aren't we all guessing in the end? So, while we agree presenting Bigfoot behavior as facts is a little much, we would defend the practice of tossing out the modifiers that indicate we are speculating when describing possible Bigfoot behavior. It's Bigfoot, its all going to be speculation by default. When we claim, "Bigfoot prefers to be at a higher elevation overlooking game trails," we don't think it will be accepted as a fact but speculation by default. Below is a excerpt from Sharon Hill's article which we encourage you all to read and give your opinion. Self-styled Bigfoot researchers make claims that suggest they know more about Bigfoot than Bigfoot might know about himself. They can tell me what Bigfoot likes and doesn’t like, where he sleeps at night, how he avoids detection, and how he communicates. 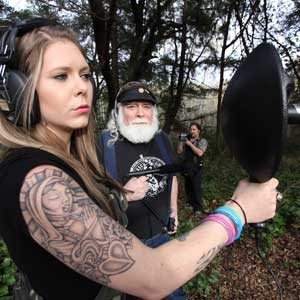 They tell the public that Bigfoot makes those sounds they hear at night. They find locations where a Bigfoot passed through or slept or built a shelter. These researchers even know about Bigfoots’ “culture”—what they do with their dead relatives, how they can fool humans. But apparently they don't know enough to catch one. Perhaps there is confusion over what exactly is meant by “fact.” That word doesn't have a hard and fast definition, but rather one that is based on how the statement is verified—from universal on the left end to personal verification on the right. A scientific fact is at the extreme left end. It is incontrovertible, verifiable to anyone who wants to check it. Facts are the building blocks of theories that describe how nature works. A more everyday usage of the term “fact” is in the middle: a statement that can be confirmed to the point where the consensus will be that it is true, it really occurred, or it is certainly the case. That infers that there was some process undertaken to establish some basis for what is stated. We accept a lot of things as facts not because we have personally verified them but because others probably have and/or because it is reasonable to accept those facts as true. On the extreme right side is a fact based on personal verification. “Fact” is used as a label for a statement that a person very much wants to believe or believes to be true. It's a fact in that person’s mind because he or she has accepted it completely: “I know this is true. I’ve seen it.” You probably won't be able to sway that person’s belief with any counter facts of your own. Religious facts are in this category. Read the rest of the article titled You are Not Entitled to Your Own Bigfoot Facts where Sharon Hill makes an example of Matt Moneymaker. But we will still stand by our position; some of us Bigfooters talk about Bigfoot behavior without acknowledging is is mere speculation, because speculation is inherent to all Bigfoot discussion. The ManfieldNewsJournal.com reminds us that one of the original four horsemen of Sasquatchery, Peter Byrne, will be a special guest this coming Sunday at the Ohio Bigfoot Conference. You can buy tickets at the door. Read the article below and then the details of the event after the article. 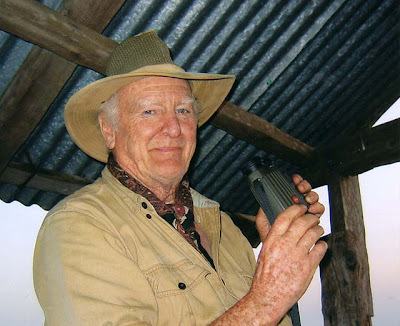 CAMBRIDGE -- Peter Byrne -- a legendary adventurer, big game guide turned conservationist and seeker of bigfoot -- will be the special guest at the Ohio Bigfoot Conference at 1 p.m. Sunday at the Pritchard Laughlin Civic Center. Byrne, who served for the British in World War II, made India his home for decades and developed an interest in the yeti. This interest culminated in a multi-year expedition in the Himalayas financed by Texas oil baron Tom Slick, who eventually convinced Byrne to organize an expedition to seek the sasquatch in the Pacific Northwest. Byrne is founder of the International Wildlife Conservation Society. Other speakers at the event will include wildlife biologist John Bindernagel, surveillance and technology expert Bill Dranginis, and Believe It Tour sponsor Mike Esordi. Tickets are available at the door for $10 ($4 children 12 and under). Civic center doors will open at 11 a.m.
Bigfoot related merchandise will be for sale and attendees will be entered for door prize drawings. Time: 1:00 p.m. to about 6:00 p.m. - Doors will open at 11 a.m.. Location: Prichard Lauglin Civic Center, Cambridge, OhioGeneral Admission Tickets (Up to 400 tickets available at the door) - $10 for adults, $4 for children age 12 and under. VIP Packages are limited to a few possible non-pays, you can be added to a waiting list. An educational gathering of everyone from the devoted bigfoot researcher, to the novice and even the mildly curious. Hear from established national and local speakers, share ideas with those interested in the enigma of bigfoot, see old friends and make new ones, or learn how to become involved in a family friendly, healthy outdoor hobby. There will be a vendor area for books, clothes and everything bigfoot. With the recent explosion of bigfoot in pop culture, we will be setting aside time and a special seminar specifically for those that are new to the field and want to learn more. 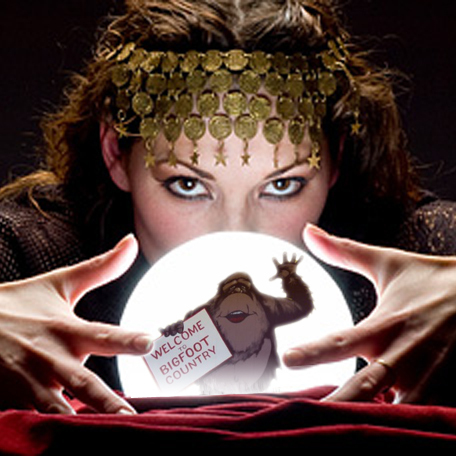 On Saturday, 4/28/2012 a Bigfoot Festival will be held. There are more details on the Activities and Schedule page. 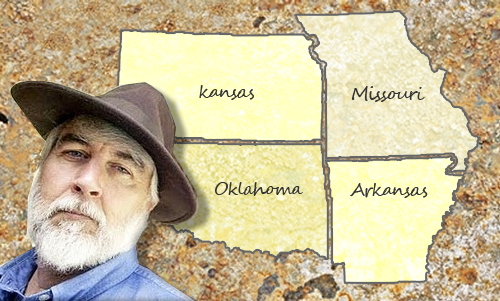 For over 20 years, Don Keating has been organizing and hosting a bigfoot conference in an area he has named the Sasquatch Triangle. It has grown to be the marquee bigfoot related event east of the Mississippi, boasting attendance in excess of 400 enthusiasts and consistent praise from those in attendance. The 2012 edition of the Ohio Bigfoot Conference is a transitional year as he entrusts this event to other respected and long-time Ohio bigfooters who have committed to continue the tradition of a quality bigfoot focused conference in the Sasquatch Triangle. The Ohio Bigfoot Organization (OBO), led by Marc DeWerth, is the host group for the conference. 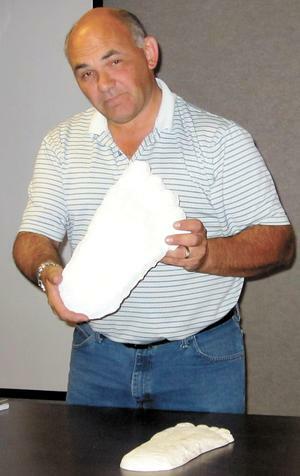 Keating holds a plaster cast of a large footprint. At the TimesReporter.com they announce the Tri-State Bigfoot changing of the guard; from Don Keating to Marc A. DeWerth of the Ohio Bigfoot Organization. Don Keating was the organizer of the Ohio Bigfoot Conferences and in 2009 allowed an entertainer who claimed to be a TV producer and an expert on the New Zealand variety of Bigfoot to speak on those fake credentials. The fake presenter even claimed to own the world’s largest feces analyzing machine. You can read the details at our previous post Hart-less. You can read the complete TimesReporter article below. After investigating the Bigfoot phenomenon for more than three decades, Newcomerstown native Don Keating is turning over leadership of the Tri-State Bigfoot Study Group to his hand-chosen successor. 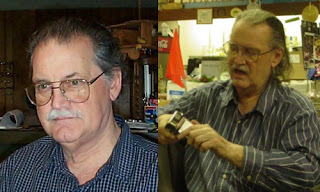 While Keating is not totally withdrawing from the search for Bigfoot, he wants to devote more time to his interest in meteorology and weather, having founded “Ohio Weather” and ohiowx.com in late 2010. Keating, who left Newcomerstown in 2006 and now resides in Cambridge, intends to be a big part of Sunday’s “Ohio Bigfoot Conference 2012” in Cambridge. 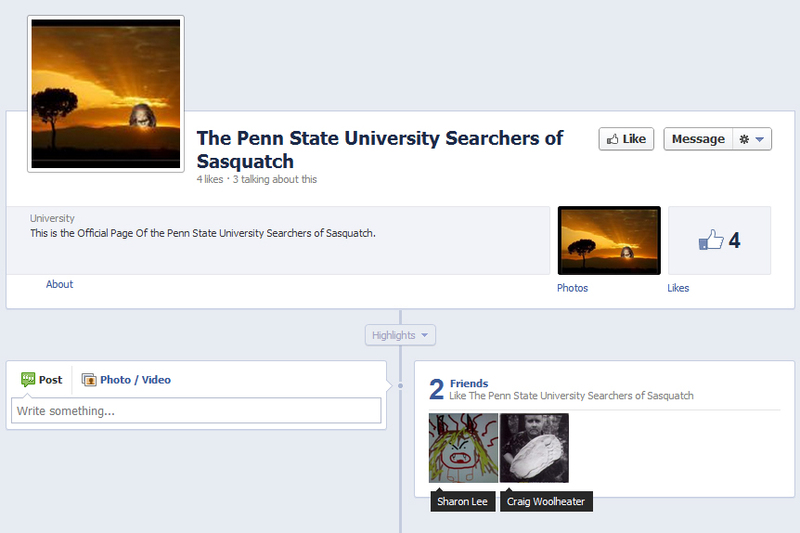 He also plans to hold Bigfoot study group meetings in August, October and December. The 49-year-old has found what he calls “interesting artifacts in the ground.” Although he knows some to be fake, others tracks appear to be real. After more than 30 years of trying, Keating has never been able to obtain any body parts that scientifically can be proven as being from a Bigfoot, also known as a Sasquatch. “We just don’t have the scientific evidence,” he said. Keating began his interest in Bigfoot in 1980 by writing an article on the topic of an alleged sighting near Newcomerstown. He officially started investigating in July 1984, and he’s been holding conferences since March 1989. Keating is turning over most of the group’s reins to Bigfoot researcher Marc A. DeWerth of the Ohio Bigfoot Organization. He credits Keating with growing the “Annual Bigfoot Conference” into the largest event of its kind anywhere in the world. The Ohio Bigfoot Organization, DeWerth said, is dedicated to continuing the conference every spring for years to come. Members are hoping to grow it to a three-day event, Friday through Sunday. Our Pal Steven Streufert of Bigfoot Books will be on Coast to Coast AM Tonight! First Hour: Plastic surgeon Dr. Tony Youn talks about bizarre and botched surgeries. 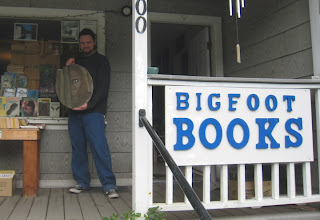 Steven Streufert: A scholar of Bigfoot history, Steven Streufert runs Bigfoot Books, an all-purpose used and rare book shop located in the heart of Bigfoot Country, and specializing in Sasquatchiana, among many other interesting things. Lyle Blackburn is a frequent contributor and cryptozoology advisor to Rue Morgue magazine, one of the leading horror media publications in print today. Lyle's Monstro Bizarro blog is featured on Rue Morgue's website and his "Monstro Bizarro Presents" news column appears monthly in the print magazine. He has also contributed to websites such as Cryptomundo.com, and has been a featured speaker at paranormal conferences and horror conventions around the country. Growing up in Texas, Lyle has always been fascinated with legends, lore and sighting reports of real-life "monsters." He has studied the phenomenon in legend, fact and film, and is the author of The Beast of Boggy Creek: The True Story of the Fouke Monster. Lyle is also the founder and frontman for the Texas-based rock band, Ghoultown. Since 1998, Ghoultown has released eight albums, toured extensively in both the U.S. and Europe, and has appeared on several horror movie soundtracks. Most recently, Lyle and his band collaborated with legendary television horror hostess, Elvira - Mistress of the Dark, to create her new theme song, which was also turned into an extended music video. The video was featured on Elvira's Movie Macabre television show, which is syndicated throughout the U.S. on local stations. Tony Youn, M.D. is a board-certified plastic surgeon. Youn made his national TV debut on Dr. 90210 and has been a frequent guest on The Rachael Ray Show and The CBS Early Show. He has written articles for RADAR magazine, MSNBC.com and CBS News.com. Tony's blog is the most popular blog by a plastic surgeon in the country. Mike Rugg is has a long history with Bigfooting. He is owner/curator of the Bigfoot Discovery Museum in Felton, CA. He has been doing research on the subject for over half a century. Through his museum he attempts to educate the public at large about the probability of bigfoot and the current best guesses as to its habits and its place in the natural world. He is also involved in field studies as he has discovered that the local mountains have a history of bigfoot sightings beginning in the 1870’s and continuing to the present day. he also hosts the annual Bigfoot Discovery Days. You can read our previous Mike Rugg coverage, you'll especially want to check out the Amazing Amanda interviews. Below is the full article of from SantaCruz.com. Enjoy. When I found out I’d be going Bigfoot hunting with Michael Rugg, I figured we’d hike deep into the woods to some remote destination to conduct our search. In actuality, we spend most of the time in Felton, right along the road and close to the nearby homes. I meet up with the crew at Taqueria Vallarta in Felton, where we eat tacos and wait for the sun to go down before heading out the crew’s usual spots. The first place is partway up a winding road in a neighborhood where Rugg says he’s gotten several reports of Bigfoot sightings. We park in a dark space between two homes and settle in, and I get a chance to get to know the team. Rugg, the undisputed leader, has a commanding presence despite his small stature and calm voice. At 66, with a gray beard and full head of gray hair, he’s surprisingly energetic and passionate. Ralph Jack, who has been working with Rugg since 2006, is a funny, happy-go-lucky guy with long hair and a thick California accent. Jack says he was actually a prospector in his younger days, and that he owned a landscaping business until recently. In stark contrast is Ashley Membree, a Cabrillo College student in her early twenties who’s been volunteering at the museum in her spare time for a few months. Bigfoot hunting, it turns out, involves a lot of sitting and waiting. Membree holds a boom mic and headphones, aiming it at the nearby mountain range. Jack has a camcorder and audio tape recorder on constant record, just in case. Rugg looks at different pockets of trees with a pair of night vision binoculars. I put on the headphones, but can only hear coyotes. Rugg explains to me that normally they go out much later in the night, usually starting around 11pm, when all the people and cars have quieted down. But even late, he tells me, they detect very little activity most nights. “We have some Bigfoots down here (in Santa Cruz County) that are real people-savvy. They’ve been hanging around us for years and they know how to get around us,” Rugg explains. That doesn’t mean there aren’t successful nights. Earlier at the museum, Rugg played me two audio clips. The first was recorded at the Forest of Nisene Marks State Park in Aptos three years ago. It starts out with a group of coyotes howling. Then something else, a totally different high-pitched howl, arises in the background. It gets louder and quieter and louder again, lasting a minute and a half. The second clip also starts out with a bunch of coyotes, but in the middle of their howling, something—it sounds like a gorilla—grunts. Rugg shows me video from the night of the first clip. They had gone to this particular spot because someone had called them up and told them that they’d recently seen signs of a Bigfoot. Jack, of course, recorded the whole evening on the camcorder. As they were walking they caught a pungent odor and heard that high-pitched howl. Later, when they walked back to that same spot, the odor was gone. They determined that meant the odor was transient and couldn’t have been coming from a rotting animal carcass. The way they figured it, that smell came from something on the move. 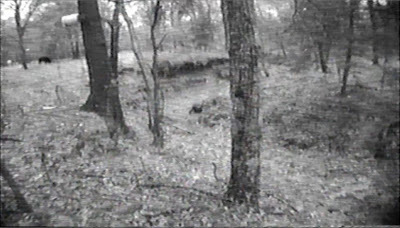 When they later watched the video, they saw in the distance a blurry figure moving between two trees. When Rugg shows me the footage it’s hard to tell what the image is, but clearly it’s something moving. Because of all these factors—the howl, the smell, the report of a sighting and the footage itself—Rugg believes they taped a Bigfoot. Of course, he also realizes that this isn’t the kind of thing to make any public announcements over. They need something bigger. “We’ve been sitting back quietly collecting evidence, building a database, going out and testing stuff, watching what everybody else is doing and realizing all the mistakes that are being made and all the crap that is going on,” Rugg says. It annoys Rugg that other members of the Bigfoot community, some of whom he’s friends with, make public statements of having found evidence when it’s only circumstantial. But, as Rugg notes, these are the people getting the funding, while The Bigfoot Discovery Museum struggles every year to keep the doors open. That was in 1950, one year before reports of Yeti were coming out of the Himalayas and eight years before reports of Bigfoots were being published in the Humboldt Times. Now, 62 years later, Rugg has spent his life searching for indisputable evidence that Bigfoot exists. He’s never had another face-to-face sighting like that first experience, though not from a lack of trying. While most of Rugg’s time has gone into research, he has made several trips back up to Northern California to find another Bigfoot. 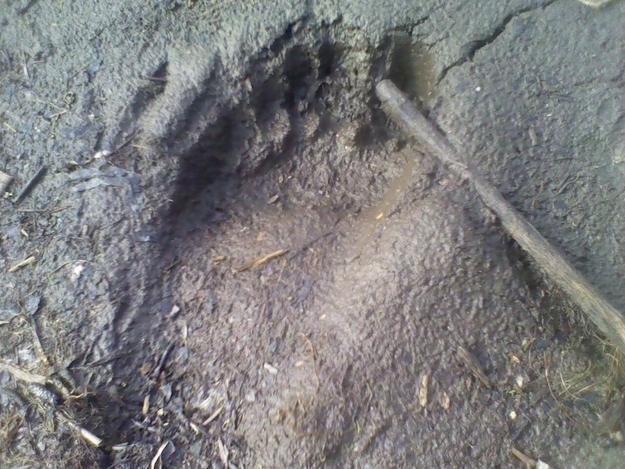 And for the last eight years, Rugg has gone Bigfoot hunting nearly every night here in the Santa Cruz Mountains. 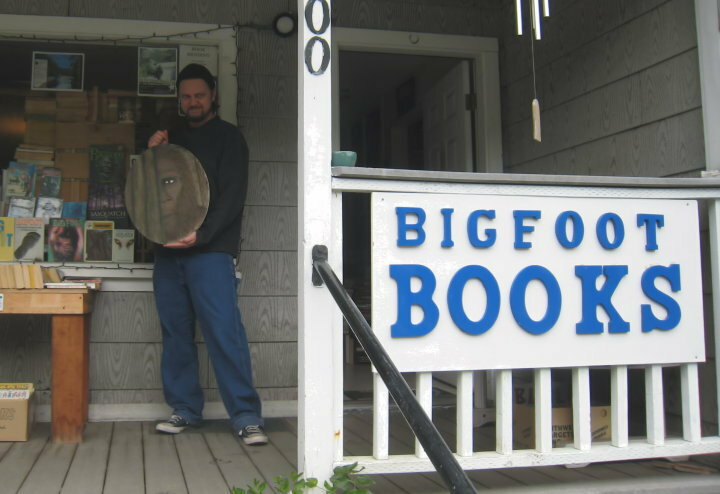 In 2004, Rugg turned his Bigfoot obsession into a Bigfoot business. Located on Main Street in Felton, the Bigfoot Discovery Museum occupies a small unassuming building with several wooden Bigfoot statues out front. The front part of the museum is set up like a roadside attraction, packed with toys, comic books and album covers. The second half is more of a research center, loaded with newspaper clippings, video clips, books, skulls and other items Rugg believes point to the existence of Bigfoot. But the real treasure in the museum is Rugg. He’s a walking Bigfoot encyclopedia. “There are few people on the planet that have thought about Bigfoot as much as I have,” Rugg says. At the Bigfoot Discovery Museum, I watch as Rugg tells his visitors about his Bigfoot encounter and eagerly answers all their Bigfoot questions. He isn’t lying when he says he’s an expert on the subject. “I heard something about Patterson giving a deathbed confession,” one guest remarks, referring to the infamous grainy 1967 footage Roger Patterson and Robert Gimlin shot of a hairy lumbering creature they claimed was a Bigfoot. One of the first things Rugg explains to me is that many people come to the museum because they’ve had a Bigfoot experience, or maybe even a paranormal encounter of some sort. They have no one to talk about it with, and they’re afraid their friends and family will laugh at them. “I hear their stories. I don’t put down witnesses. They can come in and tell me the sky is red and I’ll listen to them. The museum serves a psychiatric purpose,” Rugg says. It doesn’t take more than a couple of hours before I see exactly what Rugg is talking about. A couple in their early thirties comes into the museum, and the guy tells Rugg he saw a Bigfoot seven years earlier in Big Basin. He’s kept this experience a secret from everyone in his life except his girlfriend for fear of being ridiculed. Rugg patiently listens to a detailed account of the sighting, then tells the man about other such sightings in the Santa Cruz Mountains and comments on how similar their descriptions of Bigfoot have been to his. “I didn’t know other people were seeing Bigfoots out here,” the man says, clearly feeling better. It’s not surprising this topic gets Rugg riled up. He’s had his fair share of negative experiences for being so candid about his belief in Bigfoot. The one experience that angers him the most, he says, happened in the mid-1960s when he was a student at Stanford. Rugg wanted to write his final paper for a physical anthropology class on Bigfoot. The professor objected, telling Rugg point blank that Bigfoot wasn’t real. Rugg, of course, insisted, and the professor told him he could write the paper so long as he provided a bibliography that didn’t include True Magazine or Argosy, both popular pulp magazines of the ’60s. Forty years later, Rugg still deals with people’s teasing and harassing. He hopes at least that he can help other people dealing with these sorts of things by making his museum a sanctuary for people with experiences of the unexplainable. Rugg isn’t without people anxious to help him keep the museum alive. One of them is Kepi Ghoulie, former lead singer for the pop-punk band the Groovie Ghoulies, who were famous for singing songs about ghosts, vampires and, yes, Bigfoots. Three years ago, Ghoulie put together a fundraising concert at the Bigfoot Museum with several bands. The year after that, he held it at the Crepe Place. While he couldn’t do one last year, he is tentatively planning to do one this year in August. Avid discussion of sasquatches isn’t anything new. People have been talking about large hairy bipeds hiding in the woods for hundreds of years. But it wasn’t until the 1950s that Bigfoot reports made the mainstream media and had people all over the world talking about them. In 1967, footage dubbed the Patterson Film was shot in the mountains of Northern California allegedly capturing an actual Bigfoot walking through the woods. Whether the film was a hoax or the real thing is a subject of great controversy. But there’s no question in Rugg’s mind. He has the footage playing on an iMac in the museum on continuous repeat. “I accept that film as a type specimen. To me that’s as good as a dead one on a slab. It’s still the single best piece of evidence for Bigfoot,” Rugg says. But Rugg understands that this footage alone isn’t good enough for everyone. He hopes to find actual DNA evidence, which he’d like to see tested, vetted and written about in a scientific journal so he can end the Bigfoot debate once and for all. He says he’s confident this will happen, and whether he’s the person to do it or someone else doesn’t matter, just so long as it happens in his lifetime. In fact, Rugg announced a couple years back that he would not cut his hair till someone proves Bigfoot’s existence. The decision to open the museum and devote 100 percent of his time to Bigfoot came after a brief stint in the corporate world. After graduating Stanford in 1968 with a degree in art history, Rugg spent most of his life living like a bohemian, selling handmade dulcimers and doing freelance graphic design work to make ends meet. But in 1997 he landed a lucrative full-time position doing graphic design for Cintara, a brand building company in Silicon Valley. In 2000, when the dot-com bubble burst, he, like a lot of people, was out of work. He spent a couple years re-evaluating his life. “I came to what you might call a mid-life crisis. I was getting older. I didn’t want my headstone to say, ‘He was another idiot that chased Bigfoot.’ I want it to say, ‘He told you so,’” Rugg says. 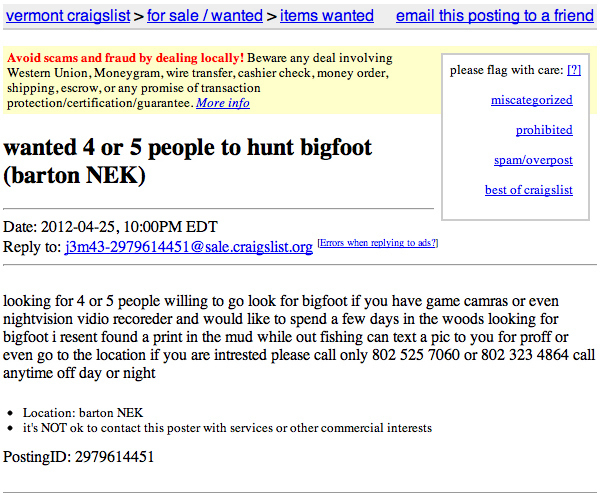 In other words, Bigfoot could no longer be a part-time pursuit. From that point on he would eat, sleep and dream Bigfoot. One thing Rugg hadn’t counted on was that he would meet so many people that had seen Bigfoots in the Santa Cruz Mountains. Rugg writes down every story people tell him about a Bigfoot sighting in Santa Cruz County. He has a large map in his museum and puts pins at the locations of the most compelling sightings. One former Santa Cruz resident, Colette Alexander, told Rugg she saw a Bigfoot in 1999 up Highway 9, just one mile from downtown Santa Cruz. She related her story to me. Before this encounter, Alexander says she didn’t have an opinion one way or the other on whether Bigfoots were real or not. She found Rugg on the Internet and contacted him. “It was absolutely insane. I thought this was kind of weird, like, I don’t know, a Bigfoot near downtown Santa Cruz. I talked to Michael and he told me about other people that had sightings in the area,” Alexander said. Rugg hears stories like this every day. He’s heard so many, he’s altered his theories on the intelligence capacity of Bigfoots. “It doesn’t seem logical that a dumb ape could be so adept at hiding and so aware of us and our relationship to them,” Rugg says. White Bigfoot or Patchy Ungulate?